Isleworth has been a riverside settlement for over 4000 years. Neolithic remains have been found between Syon House and Brentford, and a Roman settlement is known to be situated on the ham in Brentford. The Domesday Book 1086 mentions a settlement in Brentford recorded as Gristelesworde in the hundred of Honeslaw. The Hundred of Honeslaw includes the parishes of Isleworth, Heston and Twickenham. There was a priest, 2 Knights and 117 villeins, borders and cottars resident in the village, with two mills and and a fishing weir. There is no record of the time when the first church was built. 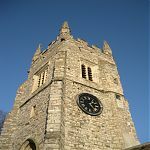 The tower of the present church is 14th Century. There was a religious house in Isleworth under and beside the present Syon House. This Abbey housed a Swedish order of Bridgettine Nuns who built Syon Abbey. In 1539 Henry VIII dissolved the monasteries and the Bridgettine nuns were forced to leave Syon and settle in Flanders. In 1541 Queen Katherine Howard was imprisoned at Syon for three months. The Royal Barge that took her on the fateful journey to the Tower of London left from Isleworth stairs. King Henry VIII died in 1547 and his body was rested over night at Syon on route from Westminster to Windsor for burial, with a large train of knights and noblemen some four miles long following the hearse. The King had been dead for two weeks and the remains were swollen. The body of Henry rested in the Church which is assumed to be in the Abbey at Syon. The ferry at Isleworth started in the reign of Henry VIII. This crossed the river from the steps in front of All Saints Church and went across the Thames to Old Deer Park. George III. This was situated at Railshead in front of Gordon House and carried pedestrians and carriages to Sheen. This ferry was still operating in my youth (approx 1959) and the Ferry man was Mr Con Dargon. 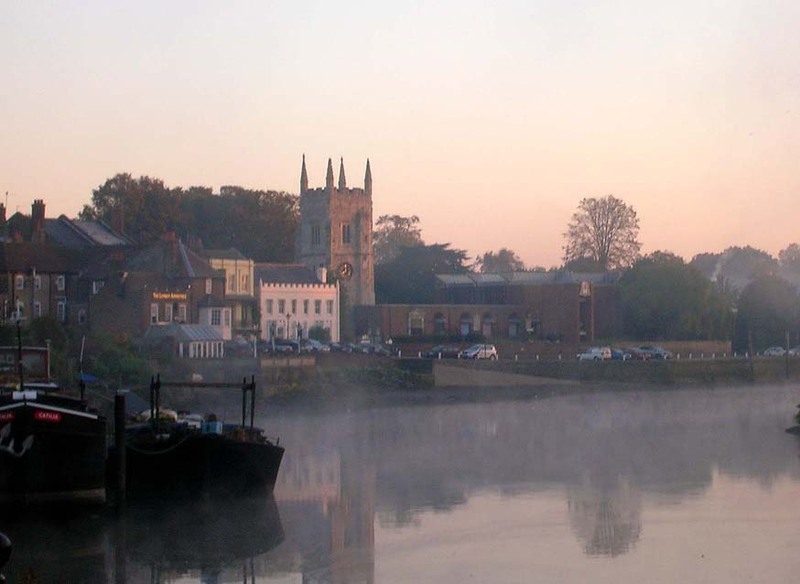 One 17th Century resident Sir Thomas Ingram came to Isleworth in 1656 and lived in Shrewsbury Place which stood on the site of Lion Wharf. Sir Thomas founded the oldest alms house in Isleworth in 1664 in Mill Plat. The great plague of 1665 took the life of 149 local residents. 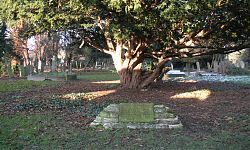 A stone in the church yard marks the Plague Pit. Many of the victims in the City of London were shipped out by barge and buried in Isleworth. A charity school was recorded to be in Lower Square in 1623. It is thought that it was stood where the 1841 Blue School building now stands. 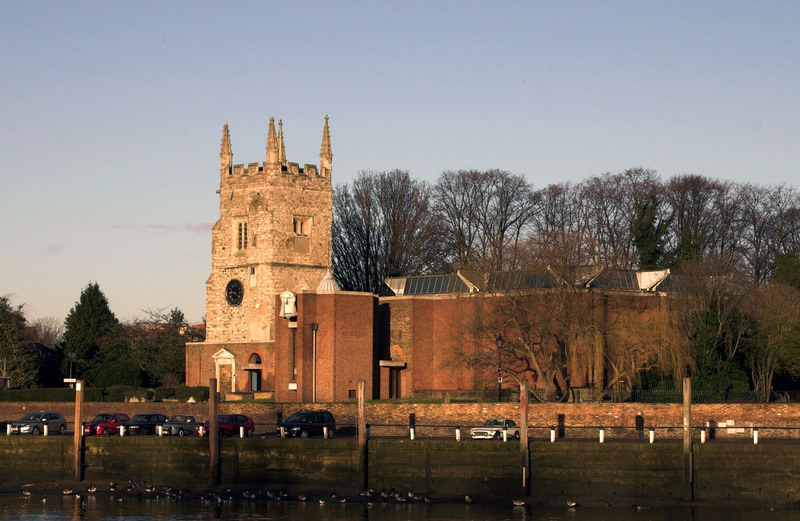 The earliest recorded date of a church at Isleworth is AD695 when the Bishop of London, in a charter to to Berking Abbey, mentions that King AEdelrid had given to the Abbeyh land and called it Gislheresuuyrth, the original name for Isleworth. Christopher Wren redesigned the church but was to espensive to carry out. The then Vicar and Wardens altered Wrens plans and the rebuilding started in 1705. 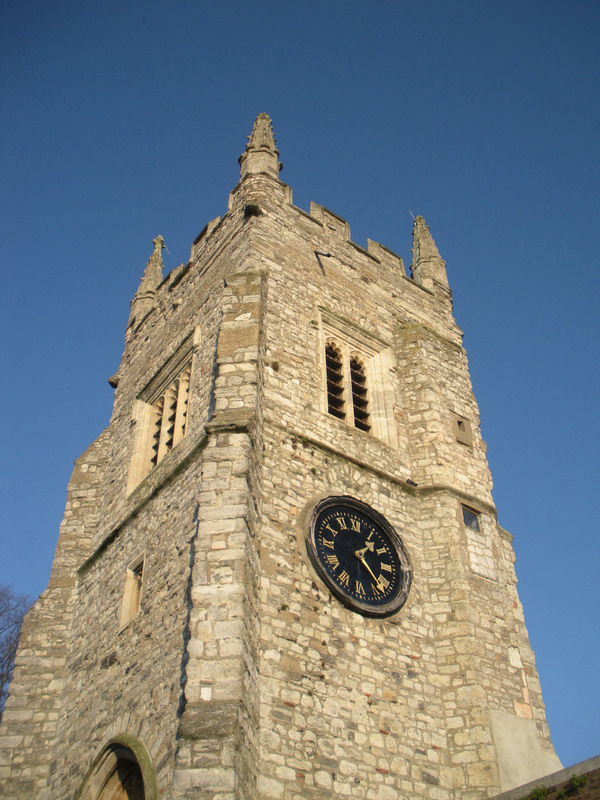 The Catholic Community in Islworth is one of the oldest in England. It was in existence in 1741 and possibley earlier (1675). Up until 1778 Catholics had to practice their religion in private as it was illegal to conduct services in public. The Parish of Our Lady of Sorrows and St Bridget emerged in 1906 – 1929 under the leadership of Father Eric Green. Father Eric Green came to Isleworth in 1906. The estimated number of Catholics was between 1200 – 1300. The services at that time were held in a back street Chapel which held 200. The Chapel ran a small school for boys and the nuns at Gumley House provide a school for girls. Father Green organised the building of the present Catholic Church on the Twickenham Road and it was consecrated in 1910. A bell tower was added in 1929 and a communal hall in 1931. Father Green was a Royal Navy reservist. He was called up in 1915 to act as Chaplain to the Royal Navy Division in Gallipoli and France. Father Green’s war experiences helped him to be come instrumental in the formation of the Isleworth British Legion. Father Green died in 1929 and is buried in Isleworth Cemetery. 386 Islworth men were killed in the 1st World War. 53 were Catholics many of Irish origin. A war memorial was constructed adjacent to St Bridgets Catholic Church and was so designed to compliment each other. The Catholic Community was closely involved with the erection of the memorial. John Gumley married Martha Whittewronge an Isleworth resident and he was responsible for the building of Gumley House about 1700. This building is now a school. 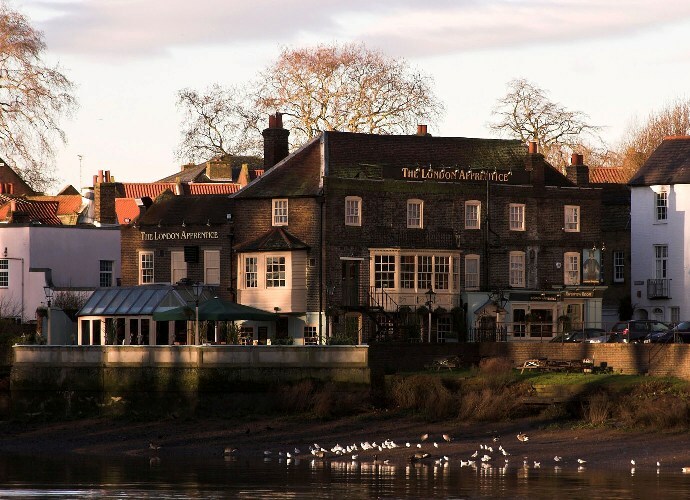 Several large houses were built in Isleworth during the 18th Century. Kendal House in Twickenham Road was built for Duchess of Kendal George I’s mistress and is now demolished. Gordon House, of course, still remains. The London Apprentice Inn was licensed in 1740. The Earl of Kilmorey had a Mausoleum built and a tunnel built from his grounds linking to it. It is said that that he instructed his aids to push him through the tunnel to the place of rest on a regular basis to practice his own furneral. Syon House was built on the remains of the Bridgattine Monastry. The house was reconstructed to the shape it is today in 1547/52. Part of the 15th Century undercroft still remains. The Percy Lion on the river side of the house was taken from Northumberland House in Charringcross. The grounds were laid out by Capability Brown. The London Apprentice Inn built mainly in the 18th Century. Parts of the structure are 14th Century. Isleworth Flour Mill at Mill Plat. Calio Mill near Worton Road. Pottery established by Joseph Shore near Railshead. Joseph was from Worcester. The pottery was at Railshead from 1760 to 1832. It move to Hanworth Road in 1832 and closed production in 1855. Nazareth House now stands on the site of the pottery. A Brewery in Islworth was first documented in 1726. It was situated on St John’s Road. In 1886 is became Isleworth Brewery Ltd and people use to travel some distance to sample the ale produced. Brewing ceased in 1952. A lot of the land in Isleworth was used for growing fruit.